The VoSI Focus List is a compilation and reference list of stocks for which Pocket Pivot or Buyable Gap-Up Reports have been issued. It is not intended as a "buy list" or a list of recommendations. Stocks on the list may or may not be in proper buy positions, and investors should exercise discretion and proper judgement in determining when and where stocks on the Focus List can be purchased. The following notes are intended to assist in this process. Removed From the Focus List This Week: Because we set the condition of having to hold its 20-day moving average on Twilio (TWLO), the stock was removed when it was unable to to do so earlier last week. The stock represents a good example of how sudden buying strength can show up in a stock and just as quickly evaporate or even reverse into heavy selling interest. General Observations: The general market repeated a year-end pattern seen in both late December 2014 and 2015 by selling over in the final 2-3 days of the year. In 2014 and 2015, such action led to sharp declines in the first week of the year, with last year's decline extending much deeper before it finally bottomed in February of 2016. This sort of volatility set the tone for 2016, which featured two sharp sell-offs during the year. The first occurred in late June after the "Brexit" vote in Great Britain, and the second occurred in early November after the U.S. Presidential Election. Both sell-offs ultimately proved to be significant buying opportunities for those who were not thrown by the establishment and media bias that depicted both events as significant negatives. 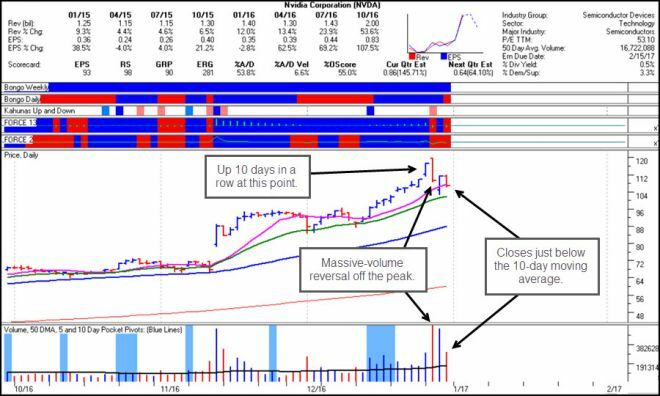 Nvidia (NVDA), no doubt the "Stock of the Year" on the long side, appears to have issued what is at least a short-term sell signal following a climactic type of upside move that saw the stock rise 10 days in a row before reversing off of the 120 price level on massive selling volume. Our view is that this is likely a climactic top of an at least short- to intermediate-term nature, and so profits can be taken into this move as we note in our Pre-Market Pulse reports earlier last week. Climactic tops can be characterized by a great deal of volatility, spurred by those trying to trade the daily swings, and are often of reasonable magnitude. One can easily run into trouble long or short. NVDA closed just below the 10-day line on heavy selling volume. More recently the 20-day exponential moving average has served as support for the stock, while the 50-day moving average has provided strong longer-term support for the stock during its entire price run since we first reported on it as a pocket pivot buy situation in April 2016 at 35.70 a share. Every name on the list currently has pulled back over the past few days as the general market sold off into year-end. 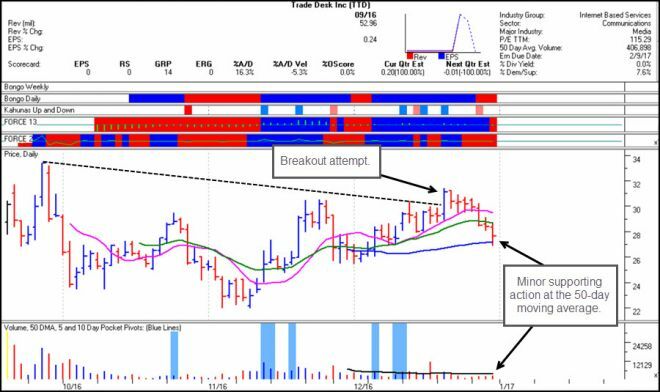 As has been the case with most stocks during 2016, breakouts tends to have a lower success rate, and we can see that The Trade Desk (TTD) has failed to follow-through on the prior week's breakout attempt from an IPO base. In the process it has sold off down to its 50-day line, where it tried to find minor support on Friday by closing off its intraday lows and the 50-day line. Whether this puts the stock in an "Ugly Duckling" sort of buy position at the 50-day line likely depends on the direction of the general market when we resume trading on Tuesday, but it is perhaps one to keep an eye on here. SunCoke Energy (SXC) is another name on the list that is also at its 50-day moving average. In these cases such pullbacks might present lower-risk entry opportunities, but only in the event that the general market is able to finds its feet after selling off into year-end last week. 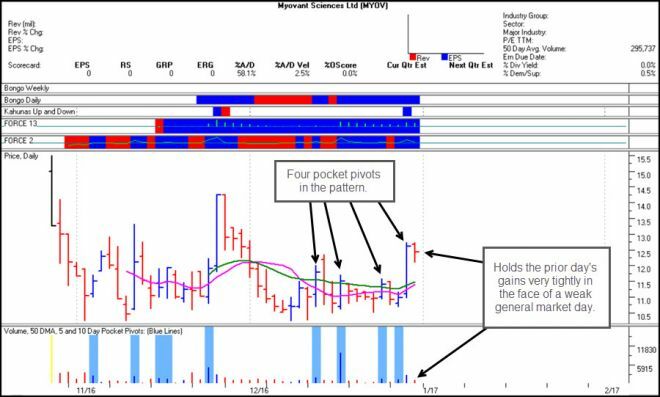 Tiny bio-tech name Myovant Sciences (MYOV) has shown some of the most robust upside movement going into year-end in the face of general market weakness. On Thursday of last week, the stock posted its fourth pocket pivot in December as it has tracked along the lows of its first post-IPO base. That was a large 14.79% move, and surprisingly, this thin stock was able to hold onto those gains in begrudging fashion as it held tight with volume drying up. This is very strong action in the face of general market weakness and within what has been a very weak bio-tech sector for some time now. Given its thin average daily volume, we would prefer to buy shares on pullbacks to the 20-day or 10-day moving averages such as on 11-23-16 when members were notified of a possible buy point, the day before it launched almost 20%. In addition, we would like to see average daily volume expand substantially as a sign that institutional interest in the name is building. Some of the better-acting names on the list are holding their 20-day moving averages currently, such as Argan (AGX), Arista Networks (ANET), and Mosaic (MOS). However, we have seen Square (SQ) and Zillow (Z) dip below their 20-day moving averages last week which could put them in a position to test their 50-day moving averages. One name not yet on the Focus List but worth watching is Quantenna Communications (QTNA). Trade has been quiet on low volume so this stock could break higher. Keep in mind it is a thinner name but fundamentals are strong. In general, the year-end action as well as the action in a number of leading and formerly leading stocks leads us towards the side of caution as we begin the New Year. And the fact that the current Focus List consists of a mere nine names is testament to the market's current tentativeness. The simple solution is to exercise discretion when entering anything on the long side, with the idea of having a very tight selling guide in mind, certainly much tighter than the 7-8% that is recommended by others. Our preference is to use nearby moving averages or other areas of potential support, such as the tops of prior bases, as tighter selling guides of 3-4% or less, where possible.